Just Eating? 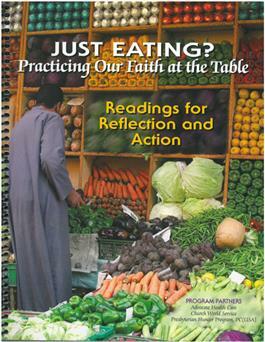 Practicing Our Faith at the Table Participants Book is a seven-session curriculum for congregations that explores the relationship between the way we eat and the way we live, published by the Presbyterian Hunger Program. The study uses scripture, prayer and stories from the local and global community to explore five key aspects of our relationship with food: the health of our bodies, the challenge of hunger, the health of the earth that provides our food, the ways we use food to extend hospitality and enrich relationships, the opportunities for action, renewal and transformation in our eating practices-as individuals and as faith communities. The Leader's Guide 7436505362 for the curriculum is ordered separately.